The first time I used a computer was at the beginning of my high school freshman year. It was one of the shared desktops in the school’s computer lab. Two years later, I discovered a vulnerability in the school’s network that allowed an attacker to gain access to exam questions and edit transcripts before they were printed. Google is just barely sixteen years old, and in its relatively short lifetime, it has revolutionized how we obtain and use information. We have become dependent on many of Google’s products in our daily lives, from its search engine, to its mapping service. It is every developer’s dream that code they write will change the world. I believe that that is more possible here at Google than anywhere else. I work with the knowledge-events team, which is responsible for building and analyzing Google’s repository of music concerts, festivals and other live events. The team’s job is to make sure that Google’s Knowledge Graph keeps up with upcoming events. Information generated by the team’s pipeline shows up in Search, in response to event-related user queries. This summer, I will mostly focus on investigating ways of improving the quality of data produced by the pipeline. This will involve modifying the pipeline to detect sources of known inaccuracies, and implementing ways of correcting them. Zachary has been an amazing host and mentor. Proactively, he has made himself readily available to help me answer any code-related questions I might have, and has gone out of his way to smooth my transition into the team. His desk is just a few feet from mine, and he regularly checks in to help me through a task I might be struggling with, explain some obscure part of the team’s codebase, or pick on a silly (but hilarious) design flaw in an internal tool. Interns and employees get to try out new products and product upgrades before they are released publicly. It is somewhat of a thrill being privy to technology that isn’t available to the rest of the world yet. The team keeps an internal dashboard that is used to query for and display statistics about data managed by the pipeline. I have just finished working on a changelist that fixes a few bugs it had, revamps its UX, and adds new functionality to its backend and UI. The new version of the dashboard will be available across Google in a few days. One of the company’s core values, and one that has become ingrained in the culture at Google, is to always put the user before any short-term financial gain. I think the most important part about being ‘Googley’ is being able to innovate solely for the purpose of improving people’s lives, and without hope of anything in return. The best burritos I have ever eaten are those at Charlie’s cafe. What is your favorite part of the Google office in Cambridge? On the third floor of 5CC, there is space overlooking Main Street that has a giant swing suspended from the ceiling. The swing is large enough for you to lie in. It is amazing. The Mountain View office organizes a boat cruise for interns and their hosts at the end of summer. I attended one a couple of years ago. It was unforgettable. Denver’s summer intern host is Zachary Clifford, a Software Engineer in our Cambridge office. He graduated from the Massachusetts Institute of Technology in 2008 with a degree in Electrical Engineering. When Zachary isn’t coding, he enjoys playing board complex games like Settlers of Catan with a group of friends. I grew up in the second largest Paris in the world (or that’s what we claim about Paris, TX, anyway). I once entered a LEGO robotics competition. My robot was named Trogdor (of Homestar Runner fame) because it was mostly notable for catching fire. Needless to say, I didn’t do very well in that competition. What inspired you to host an intern? I wanted to get involved with some of Google’s outreach programs, meet some people about to start on their careers, and get some experience managing/mentoring someone. What team are you working on at Google? Can you provide us with a high-level description of the work you do? I work on upcoming events in Search. Today you can ask Google about musical performers, and their Knowledge Card will show you upcoming events that we understand. I’m working on making the data behind it even better. We are working on a relatively prominent feature for people seeking information about artists, so I can see the impact on Search directly. The system is largely self-service for big and small performers, so I like to think we’re opening up a little bit of Search to content creators. Google is working on many amazing projects across the company, and the ability to move teams keeps me interested. I also have the opportunity to work closely with Googlers in offices around the world as part of my daily job, which is very exciting. I’ve enjoyed outlining problems we’re trying to solve with Denver and seeing what solutions he comes up with for them. Having a new team member with a fresh perspective is great for that. Treating others with respect, being a little quirky, and above all, being enthusiastic about change. I really like the sushi bar. The keys to doing well at Google are knowing the fundamentals of computer science and being able to learn new things quickly. We have some amazingly complicated systems to solve the big problems we face, and quickly understanding them is an important part of building on top of them. Zurich. I’ve already been to Tokyo, NYC, SFO, and MTV. I hear Zurich is really nice. From Google Glass to Project Loon, Adwords to Docs, our interns have the opportunity to work on some of Google’s most cutting edge and innovative projects. 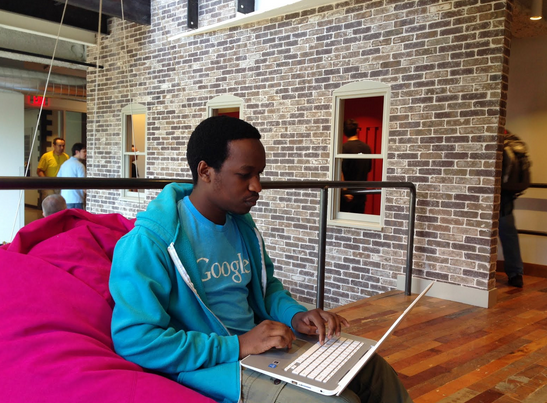 Interns also work across sales and other business functions, bringing a fresh perspective to the work done at Google. To show you just how much of an impact interns make and to highlight their unique experiences, we’re bringing you a special blog series: Google Intern Insights. Denver Ogaro, a student at Harvard University originally from Kenya, is a Software Engineering Intern in our Cambridge office. 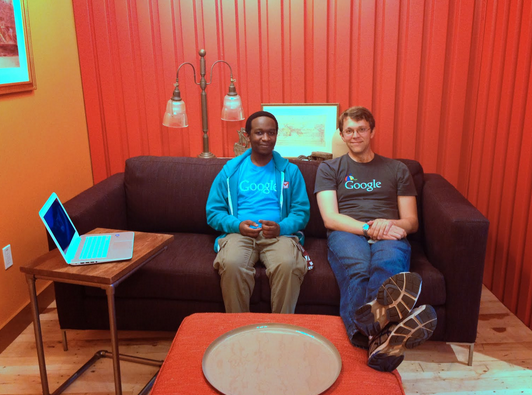 Denver is completing his third internship with Google after previously working as an Engineering Practicum intern. Denver is named after his dad’s favorite country western singer, is fluent in four languages and when he is not studying he likes to play Cards Against Humanity, play Rock Band, and watch movies.